Lockleys Bowling Club was founded in 1913. The greens were then at Cross Street, but to meet increased membership the move to the current location (46 Rutland Avenue, Lockleys, South Australia 5032) was completed in 1964. In 2006 the Constitution was changed so that men’s and women’s sections were integrated for the purposes of managing the club, although men’s and women’s pennant competitions and tournaments remained separate except for the mixed pairs. 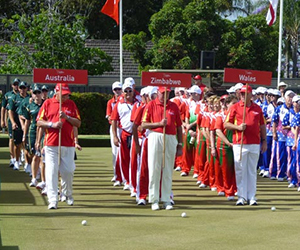 Since then, in accordance with changes made by BowlsSA (the governing body for bowls in SA), open gender competition has been introduced into all pennant events. Club tournaments remain separate, except for the mixed pairs, and social cosmo events. The wonderful layout of the clubhouse and the four greens influenced the club being chosen as the venue for two Jack High singles championships in the 1980s, with winners being well known NSW bowlers Ken Williams and Ian Schuback. 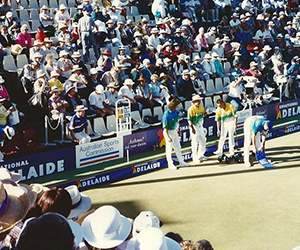 This led ten years later to selection as the venue for the World Bowls Championship of 1996. The club was further recognised by being selected to be the main venue for the World Bowls Championships in 2012. The four greens and the banks were refurbished in 2005-06 and are second to none in Adelaide. Again in 2007-2008 two greens were refurbished, and the other two were done in 2008-2009. The book, aptly named “Times Have Changed” encapsulates the ordinary and exciting events that formed the fabric of the Lockleys Bowling Club through its first century. The Book will not only be of considerable interest to bowlers with links to the Lockleys Bowling Club but also to anyone interested in the local history of the West Torrens District. Copies are available at the Club for $20-00.